"(Oct. 18) -- A Colorado climber who fell 1,000 feet off a glacier to his death has been identified, officials say. James Charles Patrick was climbing Rocky Mountain National Park's Taylor Glacier with two others Saturday morning when he slipped and plummeted off the steep and icy cliff, taking the group's rope with him as he fell and leaving them stranded. The 54-year-old Littleton resident was a master plumber and the president of Cedar Gulch Plumbing, The Denver Post reported. The phone number for Cedar Gulch Plumbing had been disconnected by this afternoon and Patrick's relatives could not be located for comment. The surviving climbers anchored themselves to the glacier and used a cell phone to call for help, according to The Associated Press. Park rangers arrived five hours later to rescue the two climbers, who have not yet been identified, and helped them hike off the glacier Saturday evening. Park rangers also stayed with Patrick's body overnight until it could be flown off the peak. 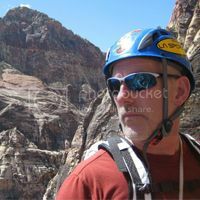 Patrick's death is the fifth fatality in Rocky Mountain National Park this year and the 11th climbing death in the state of Colorado, the Post reported. Park officials did not immediately return a request for comment today." I'm not sure about that "11th climbing death in the state of Colorado" statistic, it seems there must be many more given the years of ANAM I have read concerning fatalities in one of the most popular climbing states. Could it be the 11th this year for the whole state of CO (beyond RMNP)? One was 18 and already had been rescued THREE times in 2 years, maybe it was time for a new sport. "the rock was icy and wet, the climbers had no rope or crampons"
The other two were 500' from the summit during a pretty bad thunderstorm and lightning, which had been forecast. Wow a thunder storm at 13,000' in august , who would have thunk ? They pushed on and died. so they were unroped, he had the rope, and they were unable to downclimb? Sounded to me like a case of bravado with unfortunate consequences, where they probably appreciated the danger they were in, but each likely thought, "Hey, I'm just being a wimp as the other two don't need a belay. I guess I'll keep pressing on." Once one of them dies, the other two get the benefit of 20/20 hindsight and tie themselves in appreciating how stupid of a game they were playing. I seriously hope it's not a situation where two experienced climbers free soloed a relatively easy pitch pitch, ran into unexpectedly difficult terrain, and asked their less experienced partner to bring up the rope for a belay. With the info at hand, there an infinite spectrum of possible scenarios as to how this tragedy played out. Nonetheless, my condolences go out to the family, friends and local community.